Is there a mistake with nhl.com list of of the three stars for the Leafs-Bruins game on 25 March 2013? The Leafs lost 3-2 in the shootout, but doesn't getting to that point in the game (even after giving up a two-goal lead) merit at least one star? In case the website has changed the stars, I'll post them below. Normally this kind of oversight wouldn't bother me, but one of the three stars seems particularly odd. By the look of things, Chara played a solid if not exceptional game, so I won't quibble with his appearance on this list. However, Seguin seems to be listed here simply to remind Leafs fans (once again in case they the game's commentators didn't mention it enough in each of the games three periods and overtime) of that Phil Kessel trade whereby the Leafs acquired #81 and lost the opportunity to draft Seguin. 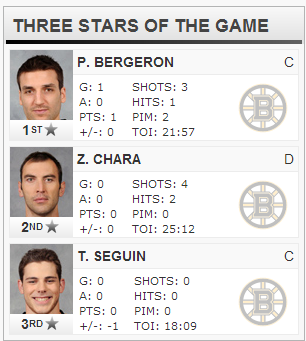 Seguin's main contribution to the game was scoring one but not the game-winning goal in the shootout. His -1 score on +/- doesn't seem deserving of game honours. So, is he being awarded for spirit or showing good character? Maybe he put partisanship aside and cheered for good hockey when the game was tied. Maybe he smeared moisturizer on the backside of his glove so that he could finish off giving Leafs exfoliating face washes by applying some soothing aloe vera cream. Or maybe someone in charge of the website just wanted to keep obsessive Leafs fans up all night. Well, if so, mission accomplished.